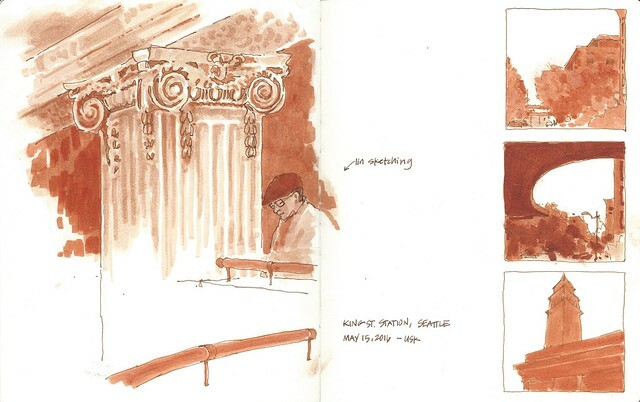 My sketches from Sunday's meetup at King Street Station were done with my usual Faber Castell Pitt markers. I spent almost two hours drawing the ornate capital on one of the columns on the upper level. Sketcher Lin made a guest appearance during the course of my sketch. After I called it done, I wandered outside for a few quick, notan-y sketches. I kind of wish I had spent more of my time on the middle one with the curved awning.... Next time. But by far the best part of the day was discovering that a couple of my Flickr "buddies" had been taking Stephanie Bower's class this weekend and getting to meet them IRL! !